Guidelines for field triage of injured patients: recommendations of the National Expert Panel on Field Triage, 2011 is an outstanding free online resource. [PubMed Abstract] [Full Text HTML] [Full Text PDF] MMWR Recomm Rep. 2012 Jan 13;61(RR-1):1-20. 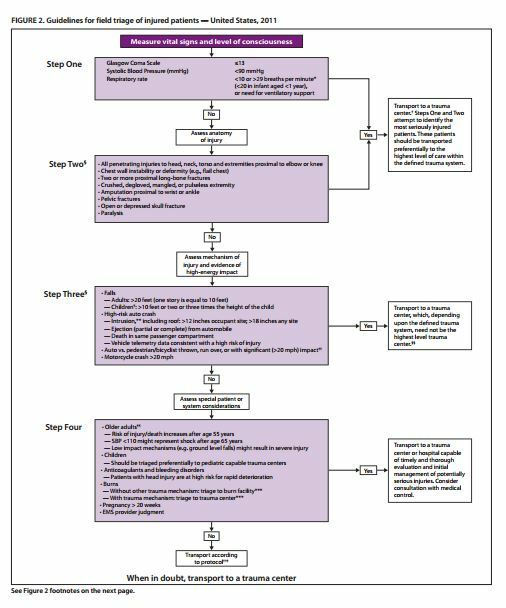 The purpose of these guidelines (2) are to provide a protocol to help prehospital providers decide the appropriate hospital for the injured patient. But all physicians and nurses will find this document worth reviewing. A review of these excellent guidelines is useful for any physician or nurse. Injured patients may not have called the life-squad but instead gone inappropriately to a physician’s office or urgent care center. This is especially possible for the type of patients in Step 3 and Step 4 of the algorithm below. Thus this document can be helpful for any physician in any setting seeing an acutely injured patient, again especially the types of patients described in Steps 3 and 4. Seriously injured patients need to be taken to a Level 1 (1) trauma center, a specialized hospital that can rapidly provide definitive treatment for any kind of life-threatening injury. So in any accident or injury, the EMT or paramedic must decide whether to transport the patient to a regular hospital or to a trauma center hospital. The decision process that the EMT/paramedic goes through to decide where the patient needs to go is called “field triage”. The Centers for Disease Control and the American College of Surgery have produced a guide to help prehospital providers decide which hospital to transport a seriously injured patient. (2) These “field triage” guidelines are for individual injured patients. 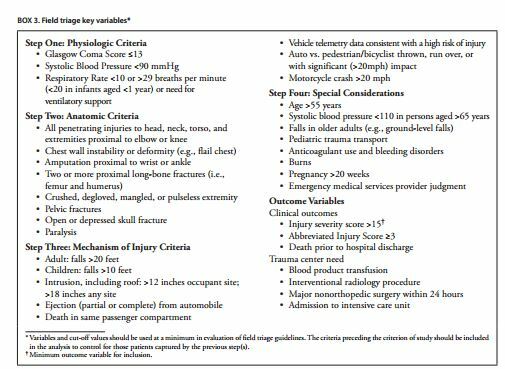 These guidelines are not for mass casualty events with many injured patients who need to be evaluated simultaneously. The first step is to measure the vital signs and level of consciousness. This is done by determing the systolic blood pressure, the respiratory rate, and the Glasgow Coma Scale. The Glasgow Coma Scale is less than or equal to 13. The systolic blood pressure is less than 90 mm Hg. (the respiratory rate is less than 20 in infant less than 1 year). If the answers to all of the above questions are no, then the EMT/paramedic proceeds to Step 2. The second step is to assess the anatomy of the injury. All penetrating injuries to the head, neck, torso, and extremities proximal to elbow or knee. Chest wall instability or deformity (e.g., flail chest). Two or more long bone fractures. Crushed, degloved, mangled or pulseless extremities. Amputation proximal to wrist or ankle. Open or depressed skull fractures. If none of the above are present, then the EMT/paramedic proceeds to Step 3. The third step is to assess the mechanism of injury and evidence of high-energy impact. –Adults greater than 20 feet (one story equals ten feet). –Children (age < 15 years) greater than 10 feet or two or three times the height of the child. –Intrusion, (5) including roof: > 12 inches occupant site; > 18 inches any site. –Ejection (partial or complete) from automobile. –Death in same passenger compartment. –Vehicle telemetry data consistent with high risk of energy. Motorcycle crash > 20 mph. If none of the above apply, then the EMT/paramedic proceeds to Step 4. The fourth step is to assess for special patient or system considerations. –Risk of injury/death increases after age 55 years. –SBP < 110 might represent shock after age 65 years. –Low impact mechanisms (e.g. ground level falls) might result in severe injury. –Should be triaged preferentially to pediatric capable trauma center. –Patients with head injury are at high risk for rapid deterioration. But when in doubt, transport to a trauma center. * All footnotes are sourced from document of footnote 2. (2) Guidelines for Field Triage of Injured Patients: Recommendations of the National Expert Panel on Field Triage, 2011. MMWR, Jan 13, 2012. Vol 61, no 1 available at http://www.cdc.gov/mmwr/pdf/rr/rr6101.pdf. (3) The experienced provider should know that the purpose of the rate of greater than 29 applied to infants is to make sure they are over-triaged after an injury the guideline explains. No harm is done if the infant goes to a trauma center for evaluation but if taken to a hospital without the resources to treat injured infants, a preventable death might result. This entry was posted in Advanced Trauma Life Support, Emergency Medicine, Guidelines, Surgery, Trauma. Bookmark the permalink.